Body modifications are deliberate acts of altering one’s physical appearance or anatomy, either permanently or temporarily. The reason behind all types of modifications is mainly aesthetic, although some might have various other reasons such as artistic self-expression, displaying an affiliation with a group or cause or to inducing shock on others. Indeed, there are different types of body modifications and the main categories of classification include ornaments, surgical augmentation, splitting or removal, application of pressure for a long time and others. When it comes to tattoos, it’s a trend that will only keep gaining popularity. The scene of body modifications is as diverse as it is widespread since more and more people have at least one piercing or tattoo on their body. Although there are still many people that judge others for their body alterations, the practice has significantly expanded in recent years. As society has progressed, most tattoos and piercings have started to become less taboo than in the past, and nowadays, people with such body modifications can be found even at formal occasions. The increase in tattooed or pierced people has been steady, even in environments such as the finance industry and the casino scene of poker tournaments. Although nowadays tattoos are a common sight almost everywhere in the world, there are still cases in which even the tattoo artists are shocked. Such an extreme example would be Australian multitalented showman Lucky Diamond Rich. 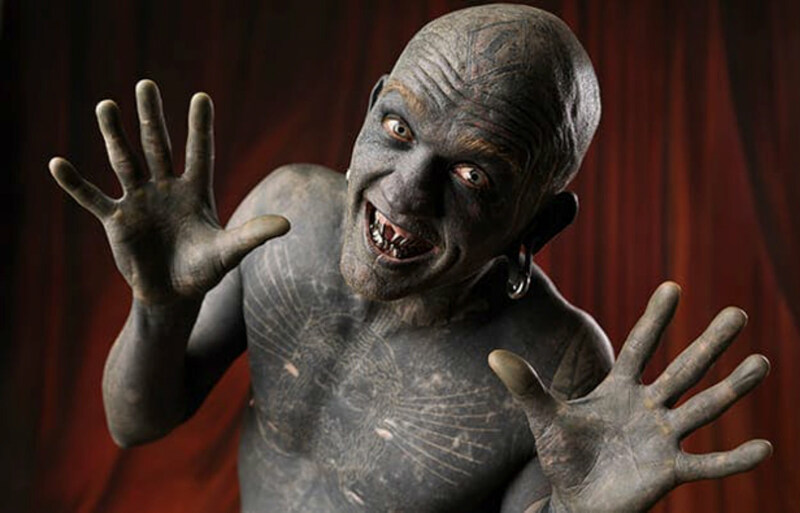 Right now, he holds the Guinness World Record for being “the world’s most tattooed person,” having an incredible 100 percent of his body covered in ink. Layers upon layers of tattoos! His evolution started with getting colorful tattoos all over his skin, but when he ran out of space, he did not stop; instead, he covered his entire body in black ink. Ok, some would say that there’s nothing more that can be done after that, but he went even further and started getting white ink tattoos over the dark pigments. As crazy as it sounds, that was not the end either because now, he is getting colorful tattoos over the white ones; in some way, completing a full cycle from color to black to white and then back to color. How many would be considered too many? To the average person, piercings are usually small decorative additions that would rarely be the focal point of one’s image. However, this is not the story of Elaine Davidson and her journey to becoming the world’s most pierced woman. When she met with a Guinness World Record representative back in 2000, she had 462 piercings, 192 of which were on her face. Elaine casually wearing a few pounds of metal on her face during her wedding. Only one year later, the number had doubled, reaching a total of 720. In the following years, her passion for piercings and the determination to get as many as possible was obvious; at her last examination in 2016, she had an incredible 9,800 piercings all over her body. Another interesting fact about her life is that contrary to everyone’s expectations, her husband doesn’t even have one body piercing. When talking about implants that serve solely aesthetic purposes, the first thing that comes to mind is breast implants. Even though breast implants are still number one, the world of implants is varied, and sometimes, the stories are unpredictable. One funny example is that of high-stakes poker, blackjack and backgammon player Brian Zembic. Despite his wins in poker tournaments and getting the chance to play the prestigious World Series of Blackjack, he is most known for his determination and the lengths he would go to win a wager. The Enigma, a character from out of this world! Unlike the poker and blackjack enthusiast, most people who get implants have nothing more to gain but fame, attention and shocking reactions from the public. These would be the cases of such performers as The Lizardman or The Enigma. Erik “Lizardman” Sprague has put in a lot of time and effort to resemble his favorite reptile, including tattooing green scales all over his body, tongue bifurcation by splitting it down the middle, filing his teeth and getting five subdermal implants above each eye. Paul “The Enigma” Lawrence is a performance artist, musician, actor and record holder for his extensive jigsaw-puzzle tattoo that covers his body. He has also undergone more extreme body modifications, such as ear reshaping and implanting horns on each side of his forehead, turning him into a real-life horror character. As society moves forward, so does tolerance toward odd looks, with extreme body modifications in the present being in a much better light than in the past. Furthermore, the trend surrounding the musical genre known as trap has influenced more and more people to get face tattoos, lowering the taboo of the practice. As we can see, body altering in unusual ways has reached beyond the world of circus and freak performances, being common in the music industry and beyond, including the luxurious poker scene. As the number of people appreciating body modification rises, so will the lengths that the performers would go to shock and amaze. The most important thing is to keep an open mind, no matter how otherworldly some people may look due to their modifications.